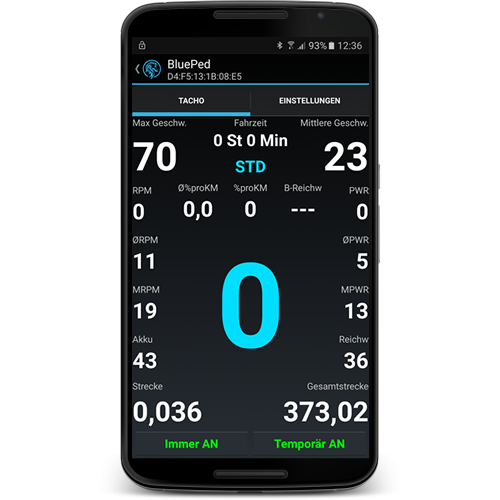 The BluePed tuning tool for Yamaha electric bikes can be conveniently controlled with a free Smartphone App (Android / iPhone). For this reason, the BluePed module offers an unusually large number of configuration options. For example, you can set the maximum engine support to an individual level from 15 up to 75 km/h (about 47 mph). It is even possible to enter a PIN code to protect the module from unauthorized access. Even if the tuning is activated, your electric bikes display will still show the correct speed and other parameters. However, thanks to App your Smartphone display can show you even more parameters than your Yamaha display. To make sure you have a good view on your Smartphone display while you are biking, the BluePed module comes optional with a FINN Smartphone holder for your handlebar. The BluePed module can be conveniently switched on / off via your electric bikes light switch. That means it is not mandatory that you have to take your Smartphone with you every time you want to use your bike. In fact, you only need the Smartphone App to specify the BluePed modules settings (after that, the settings will be automatically saved). All in all, the BluePed module is definitely one of the most elegant tuning tools for Yamaha electric bike engines.